I spent my Christmas vacation touring Malaysia with sixteen other tourists--Americans from Japan, Australians, Italians, South Africans and British. We traveled 1400 miles on a bus in ten days, through ten of Malaysia's thirteen states, and stayed in seven cities. Malaysia shares a peninsula with Thailand on the South China Sea, west of Vietnam. Nine of the thirteen states have hereditary rulers (sultans), who take five-year turns as the nations king. They have no political power, but are ceremonial leaders of the people. The four states without sultans began as British colonies. Malaysia has no typhoons, hurricanes, tornadoes or volcanoes. "It's a pretty boring place," said our tour guide. "Floods are our only natural disaster." The national flower is the hibiscus, the national animal is the tiger, the national bird is the hummingbird, the national sport is soccer and the national pastime is "eating and more eating." Malaysia's 20 million people consist of three major races--60% Malay (Muslims), 30% Chinese (mostly Buddhist) and 10% Indian (Hindu). Although Islam is the official religion, the constitution guarantees freedom of religion. Christmas is a national holiday. Malaysians have 1 car to 16 people, 1 telephone to 200 people, 1 doctor to 2000 people (but health care is free) and 1 dentist to 11,000 people. The national language is Malay, with English a compulsory second language in school. The nation's currency is the Malaysian Ringgit (RM), currently worth about a third of our dollar (3.60 RM to $1). The average monthly wage is 500 ringgit. Malaysia is one of the world's largest producer of timber, palm oil, rubber, tin and black pepper. Its number one import is heavy machinery. Our first stop was Malacca, the oldest city in Malaysia. It was founded in 1400 by an exiled Hindu prince who later became a Muslim sultan. The Portuguese took it over in 1511 and the Dutch in 1641. The Dutch traded it to Great Britain in 1824. In the nation's capital of Kuala Lumpur, we visited the National Monument, dedicated to those lost during the two world wars and the 1948-1960 State of Emergency against communism. The monument was sculpted by the creator of the Marine Corps Memorial in Washington D.C., and looks quite similar. 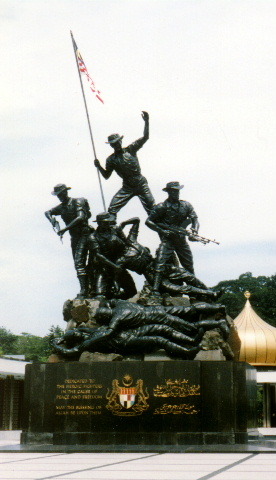 When originally built in 1963, it was dynamited by members of the Communist Party of Malaya because it depicted a CPM soldier at the bottom. The "communist problem" was mostly a Chinese affair. The Malays supported the government and the Indians didn't get involved. When the Japanese invaded during World War II, the government offered weapons to the communists to fight them. The Chinese hated the Japanese and many joined the CPM for those weapons. After the war, a rising tide of violence forced the government to declare a State of Emergency in 1948. Victory over communism was declared in 1960, but the CPM continued harassment, such as blowing up the National Monument and disrupting highway construction. When communism ended in Europe and the USSR, Malaysia offered amnesty to communist guerrillas who turned themselves in. The CPM leader Chin Peng and his followers came out of the jungle December 6, 1989. They turned in their weapons and communism in Malaysia ended. Chin Peng now lives with his family in secret in Kuala Lumpur, after forty years of jungle life. Our second night in Kuala Lumpur was Christmas Eve. My roommate and I were admiring the lights of the city from the top of the KL Tower when she realized she had left her wallet in the taxi. By the time we got back to the hotel, her wallet had already been returned. The taxi's next passenger found it, stuck in a business card, and made a special trip to deliver it to the hotel lobby. On Christmas morning we headed into the state of Perak, which produces more tin than any country in the world. Tin miners gouge holes in the earth to a depth of 400 feet. Because of the abundant rainfall (an average of 100 inches per year throughout Malaysia), the holes fill with water and become manmade lakes. Housing developments are now being built around these lakes and some are stocked with fish. Perak's royal city of Kuala Kangsar is the birthplace of the Malaysian rubber industry. From eleven rubber seeds planted in 1877 (after being smuggled out of Brazil), Malaysia now has 600 million rubber trees and provides 26 percent of the world's natural rubber. Each rubber tapper on a rubber plantation handles 500 trees per day, scraping thin 12-inch-long diagonal strips of bark off the sides of trees. Thick white liquid drips into a small bucket and thickens into a rubbery substance. The trees shut themselves off after four hours. Two days later, another strip of bark is sliced away. This continues for thirty years per tree. We spent Christmas night in the Cameron Highlands, after driving up a narrow mountain road through the jungle. Malaysia's jungles are the oldest in the world because they weren't hit by the Ice Age. Malaysia has 600 species of birds, 210 species of mammals, 140 species of snakes (16 of them poisonous), 150 species of frogs and 80 of lizards. All animals in the wild are protected. We drove up the west coast, through mountains along the Thai border and down the east coast, spending several nights at beach resorts. Back in Singapore, we welcomed the New Year before leaving our hotel at 4:30 AM for the return flight to Japan.